I work at home. But I don’t work alone. The occasion for the moment? 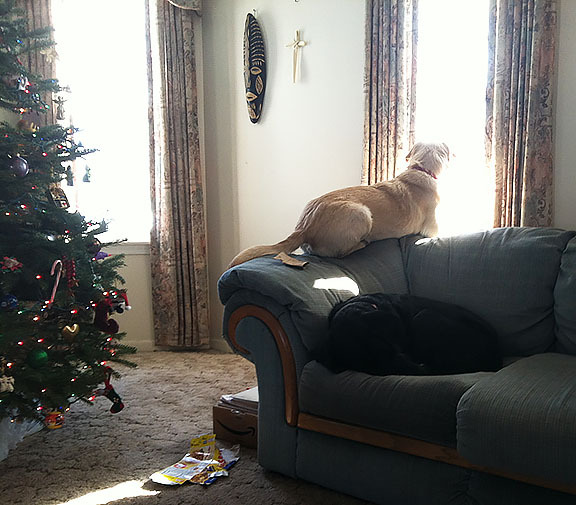 Watching the mail carrier from his truck a block-plus away, walking the opposite side of the street, past us, down a block and a half, then crossing the street and getting EVER CLOSER, until he’s finally AT OUR HOUSE. MOM! He’s AT OUR HOUSE! Never mind that the same thing happens six days a week. It remains of great fascination. And while Matt The Mailman likes dogs, he does not like being jumped on, and the dumb white one does precisely that, so she has to stay inside. Plus it’s about 10 degrees right now just off the Saginaw Bay, so it’s not like she can spend very long outdoors anyway, certainly not long enough to watch his whole loop. Maggie is no less excited about the mail, and when she is outside she wags her whole hind end, sometimes barking deeply in appreciation. Matt has learned that despite how frightening she looks to some people, the only danger is in being licked to death. At 7 1/2, she is becoming selective about how she spends her energy. When she became the only animal in the house a few months ago, we thought a puppy might perk her up, both emotionally and physically. She did indeed lose weight, and although she never has had a litter of her own, her mothering instincts proved solid. Here’s something else that happens pretty much every day. Being an 8-month-old puppy, she also gnaws a lot. 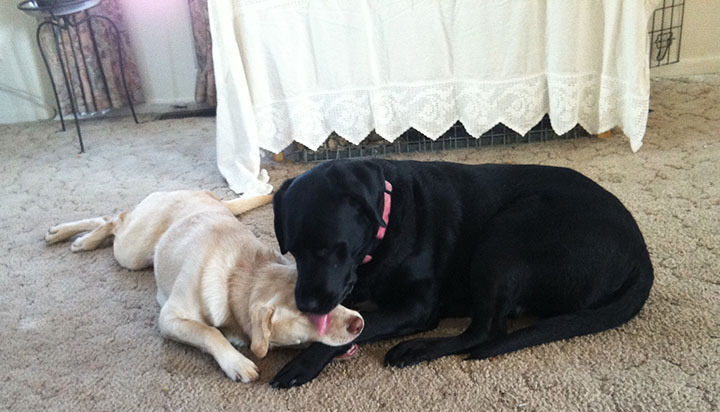 So Abbey chews on Maggie’s front leg while Maggie licks Abbey’s eyes and face clean. Other notes from the photos: Yes, that is a kennel under a table covered by a cloth. Maggie has not been crated for years, but Abbey is still prone to adopt and chew on inappropriate objects, so she is kenneled while we sleep. Your dogs sound completely adorable! Thanks! They are, but sometimes a little needy. Maggie in particular starts pacing if she doesn’t get to sit right next to me at least part of the workday.